Gwendolyn Strong Foundation : Blog : We Are In 4th Place For The $1M—Keep It Up! Chase released the first leaderboard tonight and guess who is in the top 5? Yup, you guessed it! 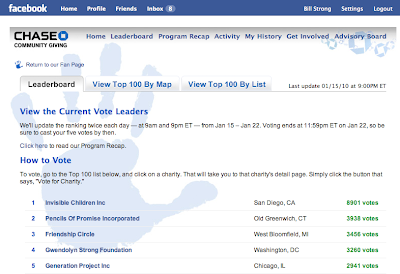 Gwendolyn Strong Foundation --- the SMA community ---> and we're in 4th place right now out of 100 organizations. If you ever doubted the collective power of a motivated, united, passionate group of people, well we sure hope you are a believer now! Together...WE...ARE...MAKING...THIS...$1M...MIRACLE...AN...SMA...REALITY! It's officially within our grasp. All we need to do is keep on doing what we are doing. This is confirmation that the efforts of each and every one of us is paying off. Don't even think of taking the foot off the gas. If anything, time to step on it Continue to be creative, be relentless, and truly believe that we can do this. Because WE CAN! One thing is for certain -- $1 Million means more to SMA than to any other cause. SMA is vastly underfunded yet research is on the verge of changing science FOREVER and $1 Million WILL make a difference. SMA parents fundraise relentlessly under unfathomably challenging circumstances, but we simply can't whip up $1 Million on a whim. But, we can NOW! This $1M is right there in front of us -- just within our reach. Now let's go get it for SMA!